Cavour used "realpolitik," direct use of diplomacy and sometimes force to get results. His greatest achievement was the unification of Italy. The canal that takes its name from Count Cavour is a remarkable feat of hydraulic engineering. It was designed to carry water from the River Po to irrigate the lands to the north-east of Piedmont, particularly the Vercellese region, where cultivation was hampered by dry summers. 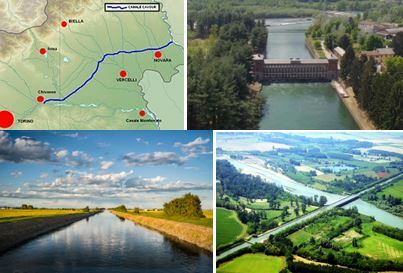 Irrigation channels were constructed in the area from the Middle Ages, but in the 1840s Francesco Rossi developed a scheme for a canal that would link the Po near Chivasso with the River Ticino near Galliate, more than 80 km to the north-east. Under the patronage of Cavour, who owned large tracts of land in the Vercelli area, the scheme was modified in the 1850s by Carlo Noe (Noah) and the canal was built with astonishing speed between 1863 and 1866, becoming one of the symbols of the new Italy. It succeeded in irrigating some 300,000 of agricultural land that was used principally for the cultivation of rice, and at some places also provided water power. Although the canal achieved its objectives, the company went bankrupt in 1868 and from 1874 it was managed by the state. The canal begins at Chivasso on the River Po, receives more water from the Dora Baltea river, passes under the Sesia River at Greggio, and follows a course to the north of Novara before joining the River Ticino at Galliate, 85 km from Chivasso. The most spectacular engineering feature of the canal is the sluice house at Chivasso where water is extracted from the River Po. It is a monumental building of brick and stone, 40 m long, with an arcade of 20 arches, which carries the inscription ‘Canale Cavour’. 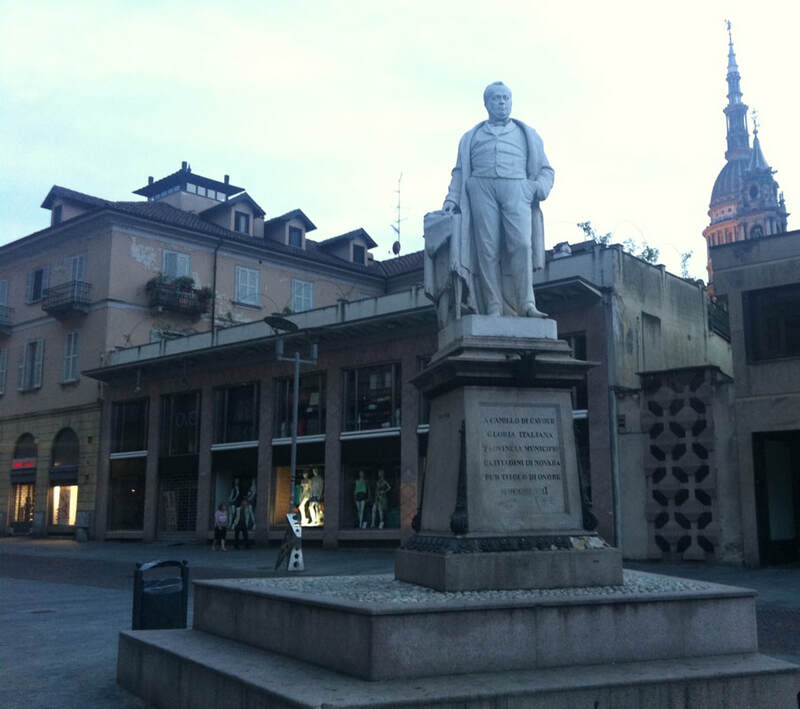 In Piazza Cavour (Cavour square) the statue of the most famous Italian statesman has been standing since 1863. Some elderly people might remember that its position has not always been the same. Once it was at the centre of the crossroads, with its back towards the railway station. But when Benito Mussolini announced he was coming to visit the city arriving by train, local politicians decided the statue should be turned the other side, in order to face and properly “welcome” the Duce. Since then nobody dared to turn it again; they simple slid it closer to the centre in order not to hamper the traffic. Camillo Paolo Filippo Giulio Benso count of Cavour (1819-1861) was the 1st Prime Minister of Italy under King Vittorio Emanuele II, and while holding this position he was also the Italian Minister of Foreign Affairs and the Italian Minister of Navy. Prior to this he was both the 9th and 11th Prime Minister of the Kingdom of Sardinia. He was also the founder of the original Italian Liberal Party and the founder of the liberal daily, “Il Risorgimento”. Before the unification he also held positions of Minister of Agriculture, Commerce and the Navy and Minister of Finance. Cavour put forth several political and economic reforms in his native region of Piedmont in his earlier years. After being elected to the Chamber of Deputies, he quickly rose in rank through the Piedmontese government, coming to dominate the Chamber of Deputies through a union of left-center and right-center politicians. After a large rail system expansion program, Cavour became prime minister in 1852. As prime minister, Cavour successfully negotiated with European powerful countries managing to maneuver Piedmont diplomatically to become a new great power in Europe: he sided with Britain and France in the Crimean War (1853-1856) and gained the possibility to negotiate in the Peace Conference in 1856. Later, he convinced Napoleon III to attack Austria, who had control of Northern Italy. He provoked a war with Austria, and with the help of the French he won. As a result, most of northern Italy voted to join Piedmont. Then Garibaldi went into Sicily and overthrew the King of Naples. Garibaldi was a radical, so Cavour moved quickly to "welcome" the liberated lands into what he now called the Kingdom of Italy. Cafè Fiorio is one of the most important cafés in Turin, one of those which have best conserved the city’s atmosphere and traditions. It was at Fiorio where the city’s public opinion was being shaped during those years when Turin was actively contributing to the Unification of Italy. Cavour and his colleagues were regulars there and one of the rooms at the café became their informal office. The place was so important that the sovereigns, both Carlo Felice and Carlo Alberto, and their ministers used to ask «What is being said at Fiorio?» to be informed about the government actions and plans. (a drink made with hot chocolate, hot coffee and cream). On the west side of Piazza Cavour, you can see remains of the ancient Roman walls, dating back to the 1st century BC, that were brought back to light thanks to some archaeological excavations. The walls were built with the opus mixtum technique, with river cobblestones linked to each other with mortar and alternating with low horizontal bricks, according to a very common model used in the cities of northern Italy. 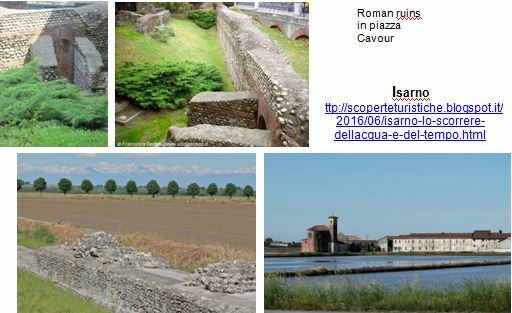 Novara became a municipium with Julius Caesar and in imperial times it was one of the most flourishing centers of northern Italy. After their demolition, the walls left place to the present "Baluardi", large tree-lined avenues that surround the old town and which are the green lungs of the city. Other remains of the Roman walls are visible in Via Solaroli. The archaeological evidences of Roman times so far collected in Novara prove that Novara had at least one public spa facility and perhaps even a private one. To boil the spa waters there was an aqueduct, whose remains can still be seen today, near the hamlet of Isarno, at the northern outskirt of Novara, not far from Vignale, along to road taking to the Orta Lake. Water probably was probably taken from the Agogna river, which in old times it was bigger than what it is now. 1. Opus reticulatum is a construction technique using small pyramid shaped blocks of tufa set in a core of opus caementicium (= concrete). The tufa blocks cover the surface, with the pointed end into the cement, so the square bases form a diagonal pattern that resembles a net, hence the name. 2. Opus latericium (also called opus testaceum) was a construction technique using bricks. It was first used in the first century BC, and it was the dominant construction technique throughout the imperial period. Many of the large imperial structures, such as the imperial baths of Rome, were built in opus latericium. Structures in opus latericium are often easily datable, because they are stamped by the producer. These brick stamps were common from the first century BC. 3. Opus mixtum mixed opus reticulatum and opus latericium. The purpose of opus mixtum was to avoid cracks. This technique was widespread in the late first century AD and the early 2nd century, during the age of Emperor Hadrian. Opus mixtum could also designate a structure in opus latericium alone, but using alternating bands of differently sized tiles. Again, the purpose is to reduce the structural damage caused by cracks.